I ended up spending the entire weekend in Charlottesville, and could easily have spent several more days trying to see everything that there is here. Saturday morning I spent updating these pages and putting my bike back together. Although I had gotten my rear wheel in good enough condition to ride for a while I decided that it needed professional attention before I pushed on very far. Since that would mean staying in town another night I also tracked down the address of the local Phi Delta Theta chapter with the intention of seeing if I could stay with the undergraduates for a while. 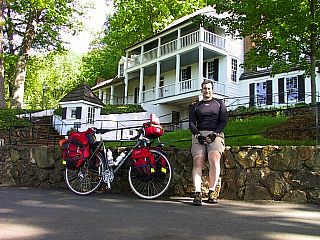 When I rode down to the address that was listed for their chapter house I found that they wouldn’t be moving in until next year. The local chapter had its chapter revoked a couple years ago, and the young men who have recolonized here haven't formed a housing corporation or finalized getting a house yet. After finding that the listed address was incorrect I was sitting on the sidewalk planning my next move when I was met by brother Steven Reinemund who literally picked me up "off the street" and helped me find a nearby bike shop to look at my wheel. Blue Spoke Cycles was able to get my wheel and tire repaired and my bike back to me just before they closed, and I spent the time while it was being worked on hanging out in Steven's living room talking with some of the undergraduates he lives with. Later that evening I met with some more of the brothers, who were having a meeting to discuss the contract they are trying to negotiate for their house next year. It was fun playing "amateur chapter adviser", and also fun to watch them interact with each other while attempting to solve their problems. Since Steven's living room had a lot of coming and going, brother Ryan Ewalt offered me a futon in his dorm room that I was happy to accept. I ended up meeting far more people than names I can remember, and enjoyed talking with all of them. 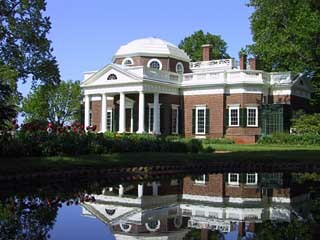 Sunday I spent riding around town and visiting Thomas Jefferson's home Monticello. Jefferson has long been the founding father who's writings have most inspired me. When we today read the words of the Declaration of Independence they sometimes seem old and dry, but when you stop to think about the nature of rights and government they proclaim you realize how revolutionary they were - and even remain so today. I spent Sunday night in a motel near campus where I could sort through all my bags and decide what to keep and what to discard. Monday morning I'll be visiting the Post Office to ship some things home and some things ahead, and then I'll be on the road again. I've decided to ship my computer ahead to myself, so there might not be any updates for several days.